Upgraded patio umbrella lights with 28 LEDs(400Lumens Max output). With matched USB cable, convenient to charge through power bank, computer or wall outlet. 2 Optional Brightness(28LED/8LED), set dim light with 8LED on, full light with 28LED on, perfect for nightly outdoor activities. Built-in 2PCs rechargeable batteries(3.7V, 4400mAh), last about 18hours at the full light and 54 hours at the dim light after 8 hours' full charge. 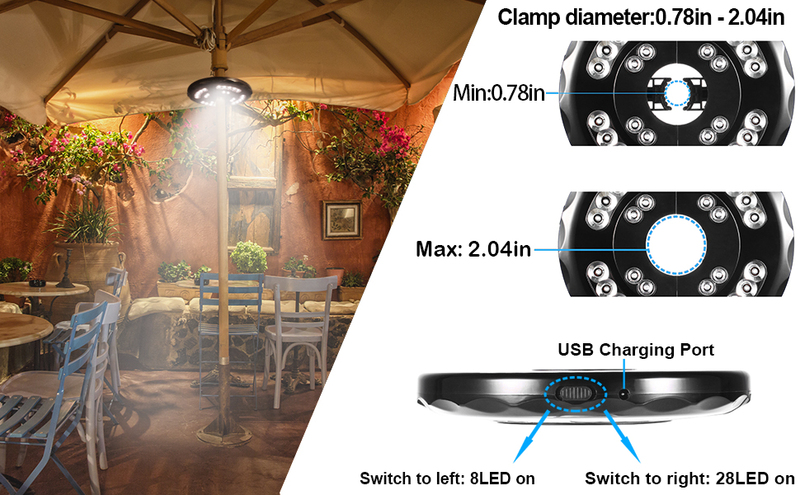 Cordless design with flexible auto adjustable clamp, easy for installation; Pole mounted fit pole size from 0.8 inches to 2 inches in diameter, suitable for most patio umbrellas. The umbrella light with top thick black ABS shell, which is portable and durable, for outdoor use, camping tent, nightly leisure time and more! Hallomall upgraded version Patio Umbrella Light with bright 28 LED beads, 400Lumens Max output, bright enough to make you enjoy the wonderful night outdoor activities. Built-in 2pcs rechargeable 3.7v 4400mah batteries, USB interface universal for AC Adapter, Computer, Power Bank and another USB powered source, easy to charge. Cordless design with built-in flexible auto adjustable clamp, no tools required, just need to clamp to your sunshade, fit for most patio umbrella poles.